Hi all.I am trying to set up my timing after my HEI died. I brought a MSD 8360 in view for future engine up-grades!I have a sbc 327 with my reconditioned 283 heads.YES i know not the best,as my 283 ate the crank and we got a deal on a 327 that we rebuilt minus the heads as they were too far gone. At the moment i have 12 initial and a total of 32 degrees with vacuum plugged.My tachometer died so rpm by ear!I have tried many of the timing set ups and have narrowed it down to 2 settings of advance springs.Trouble is the car feels flat at higher rpm!Is this because the advance timing is coming in way late according to the MSD chart (over 3500rpm)... Yes i know ...the heads!! !Oh and the cam is a Comp Cams CL12-206-2 if that helps. 1996 c1500 305 vortec.1st truck so far!350 crate motor is in....had to rebuild the engine first!! or several other factors, all must be checked and verified. Edited by grumpyvette on 02-07-19 12:59 PM. Reason for edit: No reason given. Thanks Grumpy.I have checked TDC and are using timing tape. The cam was chosen as my car is a fat old girl 65 4 door Impala sedan!Revs not needed...More torque!I am using the standard fuel lines and fuel pump.Have not checked the pressure yet.Carb is an Edelbrock 500cfm 4 barrel on an old cast iron manifold.Numbers rate the manifold from 250-320hp. I last ran the old girl at the drag strip with a best of 16.48 at 82mph...Laughing all the way!! Well after head scratching and a little more thinking about what Grumpy had written,i stood back and thought more! Yes KISS...Keep It Simple Stupid! I found that the kick down cable was moving around at times and jamming the throttle half closed!Would not do it all the time! Still to find a tach that works and also to confirm fuel pressure! Dropped initial timing down to 14 and have about 36-37 total.Goes like a rocket now! Next Drag meet on the 8th! Thank you Grumpy for your help! Now back to playing with cold-ram air induction set ups! Edited by grumpyvette on 03-15-19 04:54 AM. Reason for edit: No reason given. Hi all. Progress of thoughts...i think?? But i get good results on your 92 octane? I get a gurgling noise at times before a short pinging early-mid rpm.Sorry no tach! I have a MSD 8360 using a Blue stop limiting to 36 degrees and initial of 15 degrees.Springs are the blue and the light silver spring. At a loss of what to do..Have done many tests and over a set distance this setting gives me the best mph. that 'gurgling' and pinging sounds like the engine is detonating. Your advance may be coming in too quickly. Another thought, does your 327 have flat top or a domed pistons? With the 283 heads you could easily be well above 10:1 compression. That could also result in detonation issues with 92 octane gas. Edited by 66cayne on 02-07-19 08:52 AM. Reason for edit: No reason given. Hi.Pistons are flat tops. So try a heavier spring in the MSD? Yes, I would try to slow down the advance curve to see if that helps. Do you have a timing light to check advance as you rev the engine? The mid-60s 327/300hp engines ran flat top pistons and with 62cc heads. The 283 chevy heads had 58CC chambers. Put those 283 heads on a 327 and you could easily be over 10:1 compression ratio, especially if you are running a metal shim head gasket. If you are running a composite .040 thick head gasket you are probably okay though. It all depends on the quench area between the piston and combustion chamber. Im sure Grumpy can elaborate. 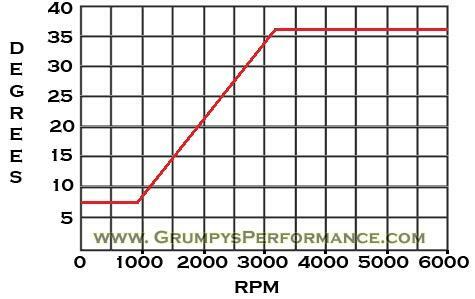 Hi.Yes using a timing light ..but no tacho!According to the MSD timing sheet,my timing starts about 1300rpm and curves up to full advance at 2500rpm.I can try a curve that starts at about the same and full advance at 3500rpm.Still using 15 degrees initial and 36 degrees total. Yes we are using a composite head gasket.Appreciate your help! Edited by 305c1500ext on 02-07-19 12:14 PM. Reason for edit: No reason given. what is your idle set at? Your mechanical advance (weights and springs) should start just a few hundred rpm above the idle speed. You are running a vacuum advance too right? Ignition Man (on the forum here) could also help you but he might be laid up right now. Time to buy a new tacho as mine doesn`t work with the MSD!! Idle is set just high enough not to stall after a rev up in drive!Running vacuum advance after i have set initial timing and full vacuum off drivers side port. Full advance at 2500 is too agressive for that engine, try 3500 as mentioned. Just went for a small drive with advance all in at 3500rpm....maybe the faintest of pinging just off idle.Back off the 15 degree initial and add more in the distributer to make 36?Go for a better drive in a few hours...lunch break! Drop the initial 2 degrees, that may be all you need to retard, then you have 34 total. My sbc, has 9.5:1, mild cam , but has a slightly looser convertor, in a 3100# car. I run 89-91 octane, no rattles. 14 initial, 35 total at 3k. Of course there are lots of variables when it comes to timing curves, but you should be in the ball park. what fuel are you running? I contacted Z a while ago and their 95 octane (RON) equates to about 91 in the U.S. rating (R+M/2) Our best in New Zealand (98) is probably only equivalent to about 93 in the U.S.
Hi Steve.I was running 95,but now 98. Our fuel is c-ap! Varies too much!! Just taken 2 degrees out..Find out tonight at the drags how she (Rosie) goes! Check the mechanical curve without the vacuum hooked up. If the mechanical only is good with no pinging then you will have to play with the vacuum canister to adjust the total vacuum or rate its brought in to get rid of any pinging brought on by too much vacuum advance. ...For a laugh...65 Impala 4 door sedan,turbo 350 trans, 16.15 sec and 85.39mph 1/4mile. Maybe a little more to come....just maybe! Just for giggles...Last drag meet with a total of 31 degrees total and the vacuum line connected. A 15.84 second run @ 86.06mph. Down from 16.18 seconds @ 82mph.Richened the carb up a little.Have borrowed a air/fuel gauge.Still pings a little,but i think we are making progress.Next step richen some more and block the vacuum line!Will bump the initial timing a little as well.Have borrowed a shift light to see if i can make gear changes more consistent! Now shifting by ear! Sorry if i am doing it all wrong...Just having fun while learning! Thanks for everybody`s help!